I’ve been teaching something that is a bit old fashioned and very much needed in this fast-paced world. I discovered the art of pyrography a few years back as a fun way to use my drawing skills in a different way. 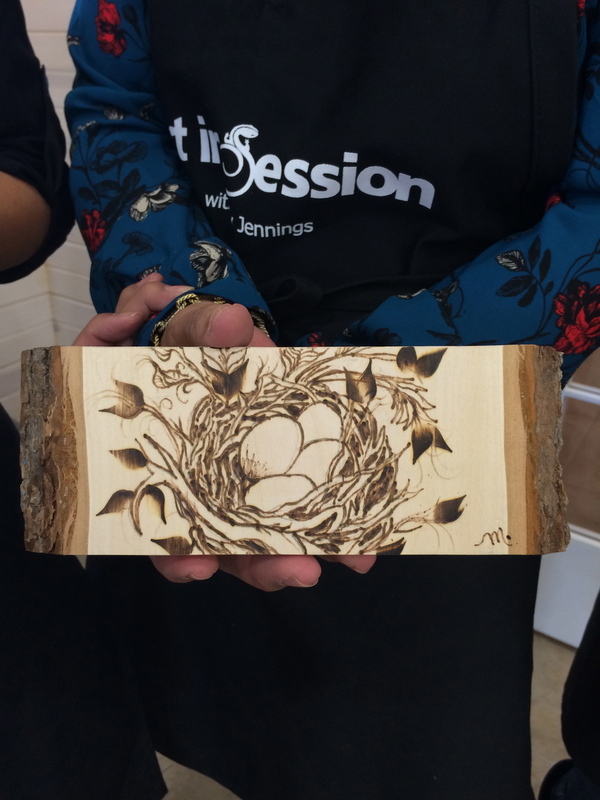 Pyrography is a technique of applying heat to wood or paper to make a mark. The word translates pyro (fire) graphy (writing) and it’s one of the oldest mark making techniques still in use. Probably as old as fire itself. It’s commonly called “wood-burning” and most people seem to associate this process with the 70s, one of the great arts and crafts making periods in our recent history. I’m doing my best to rekindle a romance between people and this great creative technique. When I teach pyrography, bringing this experience to others, I make sure to let them know that this is not a very fast process. The quality of the mark you make with the tool is dependent on the time it is in contact with the wood or even paper. I give them permission to slow down. Not to mention the tool is very hot and can be very dangerous, so it’s also a safety measure on my part. Either way, being purposefully slow is counter to our current culture and I love that I get to bring about some measure of change to peoples lives. I use Basswood as the wooden surface for the lesson, but will also show when I have used pyrography on other wooden objects, such as a wooden spoon. After a visit to Pinterest, I discovered many interesting wood-burning applications. I make sure to give everyone a chance to think about their idea or design first. This is an important step and sometimes slow for the nervous beginner. As you can guess, pyrography is forever. Once a design is decided upon, sketched out to the scale of the wood, it can be transferred on to the wood and then the wood burning process can begin. 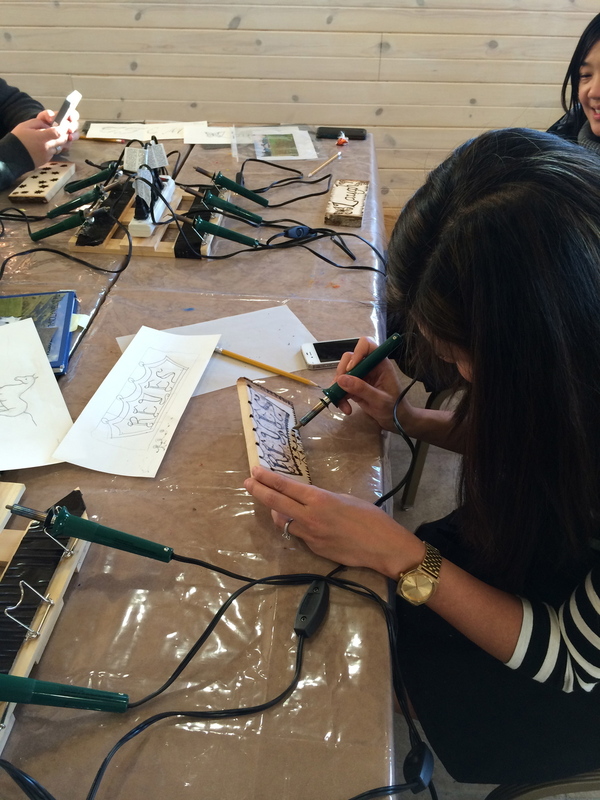 There are various tips used with the wood-burning tool that will achieve different results. The way you approach using what tips and when are dependent on each design. STUDENTS HAVE DONE A GREAT JOB! Here are samples of some student work. I am always so pleased to see how they are able to create a beautiful piece with no prior experience and in the time given for the class. I want to share this pyroFUNgraphic experience with you. I have an assignment for you. Go onto Pinterest and look at some of the terrific designs and projects people have created using this process. You might even love it so much, you might be inspired to purchase some of the tools and materials for yourself. I would recommend waiting for some good coupons for places like A.C. Moore or Walmart before making your investment. Remember, basswood is the wood to get. Pine doesn’t work as well. Share with me some of your projects in the comment section. Be on the lookout for classes and some pyrography starter sets available too.